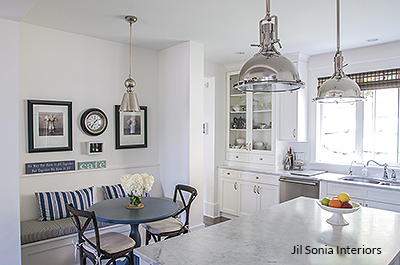 We recently talked to residential interior designer Jil Sonia McDonald, founder of Jil Sonia Interiors. Jil lives outside of Vancouver, BC, Canada and provides e-design services for clients all over North America. She also does plenty of in-person residential design in the Vancouver metro area. BC: Many people are hesitant to mix two or more patterns. What advice would you give to people who tend to go neutral or are afraid of mixing patterns? 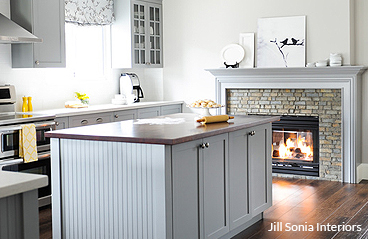 Jil: The easiest way to mix patterns is to let a designer help you—we’re experts at this! Color and pattern can add so much to your room. If you want to mix patterns yourself, I would suggest using a large pattern, a small pattern, and stripes. As long as the colors of those patterns coordinate, it will look great. If you have a neutral space without any patterns, you can always start with one pattern to liven up your room. Even just a little will help! Which colors do you recommend for designing kitchens? Right now lots of my clients love a very light, warm gray paint color for walls, such as Nimbus by Benjamin Moore. It’s a soft color and it works beautifully with a wide range of accent colors. Can you give us any tips on how to save money on a kitchen renovation? Kitchen renovations are a big undertaking, so saving money is always important! If your cabinets are in good condition, hire a painting company to paint the cabinets a soft white. Make sure you have a great painting company do this, because white is very difficult to do well. This gives the cabinets a new, fresh look and brightens the entire kitchen—and saves you the cost of new cabinets! When do you know you’ve added too many things to a kitchen? If you’re wondering whether you’ve over-accessorized your kitchen, take a photo of it. For some reason, we can more objectively understand our rooms through the lens of a camera. Whether you look at the photo on your phone, on your laptop, or on paper, you’ll have your answer right away. What are some of the biggest design challenges that you and your clients face? Luckily, we don’t have too many challenges because I use a 15-step design process. It doesn’t leave much room for error! I find clients are challenged by the sheer number of decisions that have to be made during renovations. It gets overwhelming. Even if you like to do things yourself, hiring an interior designer for two or three hours will help you get on the right track and avoid design mistakes. It’s our job to give you a home you love! Thanks for reading! I’m honored to be interviewed by Barstool Comforts. If you want more information or an online design consultation, please visit my website at www.JilSoniaInteriors.com.